Ok what's this? Could it be ..
Lol...there was a time when Keith could have fit three different dynamite riffs into one song! Looking forward to whatever...anything and everything...good, bad, ugly...warts and all. But I have faith some of it will be good, some of it maybe questionable, and some of it possibly even great! the cheerleaders, the variety of opinions, the Keith lovers, the Jagger haters (lol), and the the rambling fools (including myself), etc., etc...it's really a microcosm of IORR in general! But once I get my hands on a new Stones album (or EP? )- and I can almost smell it now - a new journey of digesting and absorbing will begin - destination unknown. Edited 1 time(s). Last edit at 2018-11-08 19:28 by Hairball. On this forum I read "nothing worthy in last 30 years" over and over again and I couldn'y disagree more. Voodoo Lounge is really great, some tracks on Steel Wheels are great (the minority, ok, but those I love), A Bigger Bang is almost unlistenable but led to a very fun and sped up tour, Blue and Lonesome is superb, Crosseyed Heart is one of my all-time favourite albums, I must say. And those albums were secondary. They all supported what's important: the Rolling Stones live. No way anyone can compare BtB to Exile or Some Girls, ok. No Bill Wyman, ok. Way too much Leavells, Cliffords, Densons... ok. But they managed to keep relevant over these 30 years, which none other could. Edited 1 time(s). Last edit at 2018-11-08 20:49 by doitywoik. Wtf..i am just so Happy the Stones are still around since 1962 and are creating a buzz with a New release..
Wow! Something is coming... Amazing!!! Good Lord, that may very well be cover art and album title/tour name. Thank God I was mistaken. Edited 1 time(s). Last edit at 2018-11-08 22:11 by Rocky Dijon. Well. It sound like LA FORUM 1976. Nothing special about that tune. Something coming - of course - would be to throw out Paris 1976 there. We talked about it already. Was there any truth to The Sun newspaper claiming they are making an EP ? One single (A & B sides) plus extended/remixed versions could also be considered an EP. Sounds very good - great. Rather an EP with 6 new songs than a Greatest Hits with 2 new songs. Just love Mick in this interview, so honest, painfully so. There is Mick saying it as it is, firing off warnings all over the place and Keith didn't see it coming, even when it was so obvious. Why was Keith so surprised Mick toured without him, he said it right there, Mick says " i'd love to tour, but not with the Stones". I guess this is just the Spanish illustrator (whose page that is) promoting his upcoming Rolling Stones illustrations. He has done other Rolling Stones illustrations in the past. I do not think this is in any way "official". Edited 1 time(s). Last edit at 2018-11-09 01:15 by MrEcho. Haha - well it does make a bit of sense considering all the troubles and delays they've had with this. Hitting the wall, Mick releasing Getta Grip while thumbing his nose at Keith, not to mention touring, family time, movie roles, etc., etc., etc. At this point I think we'll be lucky to get just an EP, and if it's a whole album it will be somewhat of a miracle. Looking forward to a new song or two, maybe three....hopefully more. Where did we get that bit? Do we now believe Universal said, "Yes, Mr. Jagger, we'll hand you a sizable budget for music videos and extended mixes just so you can piss off Mr. Richards"? As for the EP, it's nothing. A bit of stupidity from The Sun - one of the worst tabloids around as far as journalistic integrity is concerned. There's an album coming. Until Soldatti or B.V. tell us otherwise, why believe a disreputable rag? For that matter, there are several other connected regulars here. No one has suggested they've downgraded to an EP. I know the EP fits the story of "they can't do it, they can't write, they can't sing, they can't play" that has such a hold on so many iorrians. Actually, an EP would make sense to do. Followed by another one. In 2018, people will go for whatever. LPs (in whatever format) are still selling - but so are EPs and singles, in whatever format. They could release an EP at the beginning of the tour, and one mid-way through the tour. And one after. They won't. But it could work. "They ain't Stones tunes, if you want to cut them, put 'em out on your own...and the bugger went and did it." ie Mick "the bugger" released Getta Grip while thumbing his nose at Keith. No biggie, but why so serious and sensitive? Tell you what. 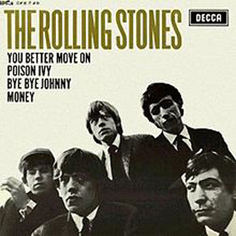 IF we simply get another compilation of greatest hits, or even obscurities, tagged with a couple/few new songs and THAT'S the best they can do after 14 years, I'll buy it, YES, just to get new Stones music, but then I'll be off the train. And I am NOT suggesting that's what they'll do. I DO think BV and others with a modicum of knowledge about what IS going on, v's The Sun, will be right and that we will get a whole new album. BUT IF 3-4 songs IS the best they can do and we get another GGRRRR....well, ggggrrrr it'll be from me, and adios! I hope though, as artists, they ARE creating an album. Respectfully, Don Was is their producer, including catalog reissues. He's not going anywhere. Mick writes and arranges songs with Matt Clifford or Dave Stewart. They are Mick's preferred collaborators just as Steve Jordan is Keith's. We can say all day that things would be better if the following people were far away from our heroes. In essence, you're wishing the past 25 or 30 years hadn't happened. Not paritcularly realistic. The new album will likely have the same reaction as their albums always have. Ridiculously overrated at the outset and then unfairly criticized once it is no longer new. They can't help it that it's not the 1960s or 1970s any more just as they can't help it that most iorrians aren't young with their whole lives in front of them any longer. I am not wishing the last 25 years away. You're right- that is absurd. Time is time, and it passes. I love the Stones the way they are now. But it is really not absurd or unrealistic to hope and wish for some change. They're artists, and artists must change. But they're also human, and one gets comfortable, a bit self-indulgent etc. The thing is 'Bridges to Babylon' was IMO a fantastic album. It was everything that the Stones could construct at this time of their career. There was challenge, new contributors, there was risk, there were great songs. And they took it on the road. It was a great album. Edited 1 time(s). Last edit at 2018-11-09 08:23 by Palace Revolution 2000. In a way it's the complete opposite now, they've worked out an "arrangement" to tour and laugh all the way to the bank but can't work things out in the studio anymore. It's not needed to tour, there's no money in it, they don't get along, they're old, have nothing of interest left to share after hundreds of songs, pretty depressing really! Ok so when's the next show? Edited 1 time(s). Last edit at 2018-11-09 11:56 by DandelionPowderman.